Pine trees were virtually the trademark of North Carolina and the Southeast in the colonial period and remain a significant feature and symbol of the state. One or more species, including the loblolly, the longleaf, the eastern white, the Virginia, and the table mountain pine, still grows naturally in each of the state's 100 counties. Conifers, or evergreens, pine trees perpetually contribute to the state's pleasant natural atmosphere, except perhaps during the spring season when clouds of pine pollen fill the air and cover the countryside with a layer of yellow powder. Pine trees have for centuries supplied many important wood products; from the early colonial years until well into the eighteenth century, the longleaf pine was a primary source of naval stores-tar, pitch, and turpentine-which were essential in the construction and maintenance of sailing ships and also gave rise to the state's "Tar Heel" nickname. Pine forests, or "barrens," were mentioned in nearly all diaries and travel accounts of those who passed through the region during the colonial period. In September 1752 Bishop August Gottlieb Spangenberg, scouting for a place for a Moravian settlement, wrote in his diary: "In Chowan and Bertie Counties one can ride for three hours without seeing anything except Pine Barrens, that is white sand grown up in pine trees." In 1791 George Washington described a similar pine-dominated landscape as he traveled south through the state along the "King's Highway," an ancient colonial route (now largely U.S. 17). Also known by names such as longstraw and pitch, the longleaf pine formed an ecosystem that once may have covered 90 million acres in the Southeast, though fewer than 3 million acres remain in the region. There are currently many efforts to restore the endangered longleaf ecosystem, including projects and programs of the U.S. Fish and Wildlife Service. In addition, the Longleaf Alliance, located at Auburn University's Solon Dixon Forestry Education Center in southern Alabama, was formed in 1995 to coordinate the efforts of various conservation groups and agencies seeking to reestablish the longleaf and some of the habitat it provided. 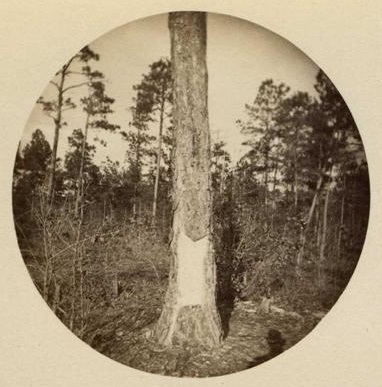 In 1963 the North Carolina General Assembly designated the pine as the official state tree. Though enthusiasts debate whether the assembly meant the loblolly or the longleaf pine, the latter is generally assumed to have been intended because of its appearance in North Carolina art and poetry as well as its mention in the first line of the state toast: "Here's to the Land of the Long Leaf Pine." Linda C. Askey, "Kissed by Fire," Southern Living (November 1999). H. J. Green, Common Forest Trees of North Carolina (1983). James W. Patton, "Glimpses of North Carolina in the Writings of Foreign Travelers, 1783-1860," NCHR 45 (1968). Walbert, David. "Naval stores and the longleaf pine." Colonial North Carolina. LearnNC.org. http://www.learnnc.org/lp/editions/nchist-colonial/4069. (accessed June 27, 2012). Sidebottom, Jill. History of the North Carolina Christmas Tree Industry. NCSU College of Natural Resources. http://www.ces.ncsu.edu/fletcher/programs/xmas/history/index.html (accessed June 27, 2012). "PHOTOGRAPH, Accession #: H.1950.103.7." From the North Carolina Museum of History. I’m interested in living in NC. Can you tell me where I might find areas that are primarily filled w/evergreen trees?